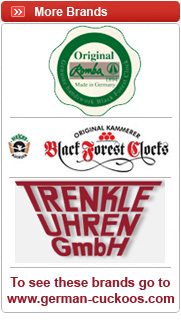 If you have any questions about the security at our web site, please send an e-mail to contact@hubertherrclocks.com. If you are not satisfied with the workmanship, you can return the clock within 30 days, and we refund you the price of the clock minus shipping and handling. Before returning your clock, you have to contact us by phone or email to receive a return authorization. The clock has to be shipped back in its original packing with all contents included. The box should not have any markings on it, and the clock has to be free of any defects. The clock has to be packed properly to avoid shipping damages and insured (we will not be responsible for damaged returns). No returns are accepted after 1 month of purchase date. 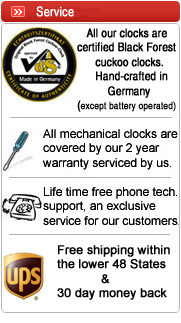 If your clock stops working within the first 2 years of your purchase, we will repair your clock for free. You do not even have to pay for shipping to get the clock to us (within the 48 continuous States). If you have a warranty case, simply call and describe the problem. Often the solution is so simple, that you can make the necessary adjustments yourself. If the problem is of a more difficult nature, we will email you a prepaid shipping label. You can drop your return package at every UPS location, or we can schedule a pick up at your house. Warranty does not cover damages caused by improper handling, chains of the wheels or damages caused by clock falling of the wall. Customers outside the 48 continuous states have to pay for shipping themselves, if they need the clock repaired. After the 2 year warranty expires, we can refer you to an authorized Hubert Herr Service Station. We offer an interest free layaway plan for all clocks valued over $299. You have the option of 2,3 or 4 monthly payments. We reserve the right to decline a request for a lay-away plan for any reason (plan only available if inventory level of choosen clock is high). There is a $10 restocking fee, if order is cancelled after making at least one payment. The clock is property of Old World Imports until fully paid. . Lay-away plan is not available outside the US. We offer free shipping on all orders over $200 within the lower 48 states. 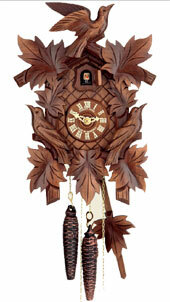 Clocks less than $200 will ship for a flat fee of $9.99 which included packing and insurance. Shipping to Canada, Alaska, Puerto Rico and Hawaii will cost extra. Shipping cost will not be calculated during checkout. Customer will receive email with a quote for shipping costs. Customer can cancel order at this point without any cost/fees (we will charge your credit card, once we have approval of shipping cost). All shipments are insured. Due to false claims of shipping damages in the recent past, we have to insist, that you open the box right away in front of the UPS or USPS delivery person and get written confirmation, if the clock is visually damaged (mechanical problems are covered by the warranty). The shipping damages have to be reported immediately. We will not honor repair or return requests for broken carvings afterwards, or without confirmation from UPS/USPS that there was a shipping damage. If you buy a clock as a gift and decide to mail it to the recipient, you will do that at your own risk. We are not liable for damages caused by shipping after we shipped it to you.